Greetings again from the darkness. It’s rare for a sequel to be a better film than the original, and we are entering unicorn territory when dealing with comedy sequels improving on the first film. So hearing that most of the original cast is back for material from the same creative team – director Sean Anders and his co-writers Brian Burns and John Morris – well, expectations would normally be pretty low. However, all of that changes when we learn of two cast/character additions: Mel Gibson and John Lithgow. 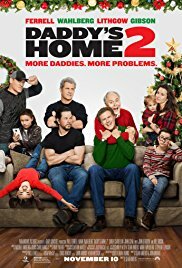 After the fierce daddy competition between Brad (Will Ferrell) and Dusty (Mark Wahlberg) in the original two years ago, this film picks up with what looks to be a very healthy co-dad environment for all involved. In comedy-based cinema, the best way to disrupt a happy family synergy is to introduce the Christmas season and the sure-to-follow family turmoil. Enter Mel Gibson as Dusty’s estranged dad, and John Lithgow as Brad’s so-close-it’s-too-close dad … and let the holiday escapades begin. At its core, this is an observational comedy about the contrast between old school and contemporary fatherhood – machismo vs emotionally open. Mel Gibson is key to the story working on multiple levels, and his performance is a reminder of his immense screen talent (in spite his personal life issues). His character’s idea of being a father has been around for many generations. Toughen up the kids and make sure they are strong and independent. Keep those emotions close to the vest. On the other side is John Lithgow and his over-hugging and blubbering true feelings approach. The familiar supporting cast holds up their end admirably. Linda Cardellini and Alessandra Ambrosio are back as Brad’s and Dusty’s wives, respectively. Scarlett Estevez, Owen Vaccaro, and Didi Costine are back as the kids – each with their own quirks and growing pains. Even John Cena returns as Adrianna’s biological father, and to deliver one of the film’s best punchlines, as well as a bit that might forever ruin Christmas caroling for you. The trailer, as with most comedies these days, gives away too many of the funny moments, so don’t expect any additional spoilers here. There is some comedy brilliance mixed in with the cheesy, over-the-top slapstick (a snowblower scene that could have easily worked in CHRISTMAS VACATION almost 30 years ago). The brilliant moments are often the quieter ones, and they focus on parenting, family, and the challenges of childhood. There is a surprising and unusual cameo near the end, and the movie is well executed to satisfy its built-in audience, while also capitalizing on those who enjoy (and/or need) a good, clean comedy at Christmas time. This entry was posted on Thursday, November 9th, 2017 at 7:12 pm and is filed under Comedy. You can follow any responses to this entry through the RSS 2.0 feed. You can leave a response, or trackback from your own site.